I didn’t get round to posting last weekend as I was at a Hen Party. 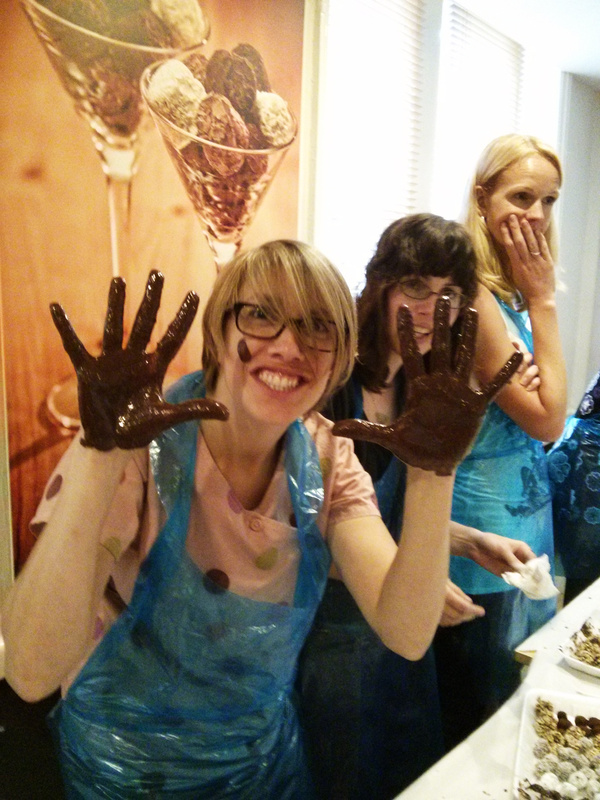 As part of the party we went to the Chocolate Boutique Hotel in Bournemouth to take part in a chocolate making workshop. 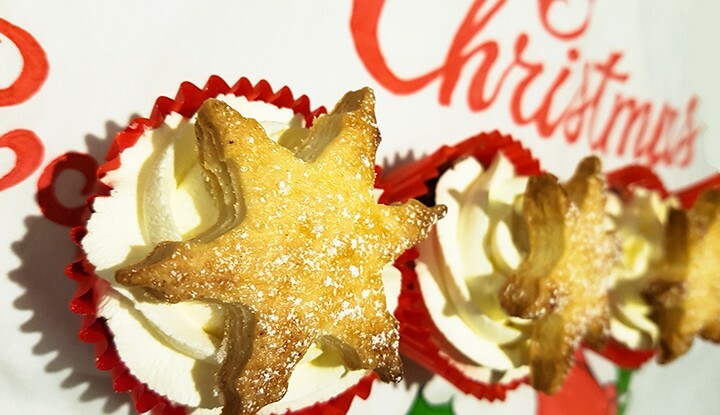 I had a go at making truffles a few Christmases ago and they went ok, but I have always wanted to know how to make them properly so was really excited for this! And what a great couple of hours. We learnt about the history of chocolate, could help ourselves to a chocolate fountain for the 2 hours we were there and were taught step by step how to make chocolate truffles. And whatever we made (I made about 30) we were able to package up and take home. 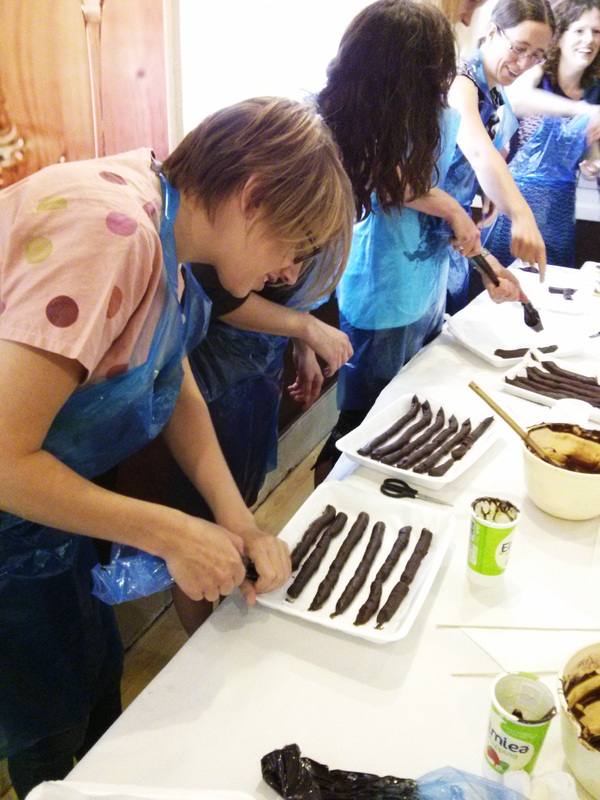 I would highly recommend this course for anyone interested in making chocolate. And if you want to make them regularly and you want to make them as gifts I would definitely recommend buying a thermometer so you can temper the chocolate to get a nice shiny effect. I have just come across this brilliant spatula with built in thermometer which I will be purchasing this weekend! I haven’t put any weights as it really depends on how many truffles you want to make. To give you an idea, Ganache is the centre of a truffle and is a mixture of chocolate and cream on a 2:1 ratio. And if you melt too much chocolate for the coating there is a great tip at the end to use it up! Melt the chocolate to 38/40 degrees using a microwave or double boiler. Stir until all the mixture has amalgamated together. Spoon the mixture into the piping bag and pipe even straight lines onto the grease proof paper. Leave to set semi firm. Taking a kitchen knife and cut down the lines of gnash to create even sized logs. Wipe the knife with kitchen roll between each cut to prevent a build up of chocolate on the knife which will cause the logs to stick to the knife. Roll the logs of ganache into balls to form your truffle shape. Use your finger tips as they are cooler than the palm of your hand. 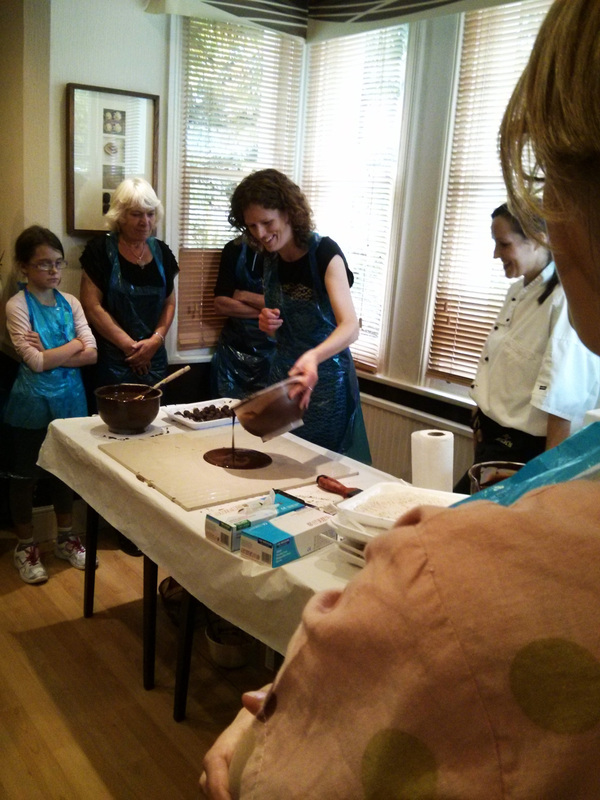 If you find the chocolate is melting lots then your ganache might not be set enough or you might have ‘hot hands’. Either put your ganache in the fridge for a few minutes or wash your hands and cool with cold water. Be sure to dry your hands properly to remove all water. • Working the molten chocolate on a heat-absorbing surface, such as a stone slab, until thickening indicates the presence of sufficient crystal “seeds”; the chocolate is then gently warmed to working temperature. • Stirring solid chocolate into molten chocolate to “inoculate” the liquid chocolate with crystals (this method uses the already formed crystal of the solid chocolate to “seed” the molten chocolate). Unless you happen to own a stone slab I would recommend the second. This should create a beautiful shiny chocolate to coat your truffles. On the course we used the slate method so I haven’t actually tried the above yet. There is a great guide on this process here. Lay out your toppings on trays. Dip your fingers into the tempered chocolate and coat each truffle. Take care not to put to much chocolate on the truffles as it will run off and create a ‘base plate’. Leave to set. Coat your truffles again with the temper chocolate and then put them straight into your topping. Using a fork roll the truffle in the topping to ensure it is evenly coated. Leave the truffles in the topping until set. With the cocoa powder and icing sugar gentle sieve the truffles to remove the excess. And there you have it – beautiful handmade chocolate truffles. They are delicious. And if you give them as a gift they will be gratefully received. Everyone loves chocolate so a bag of handmade chocolates are even better. Don’t let the tempering process put you off making these. You can even buy chocolate drops that are pre tempered so all you have to do is melt them down and they are ready to go. They do make a mess, but for a special occasion they are most definitely worth it! With the left over chocolate, tip a handful of Demerara sugar in, 4/5 drops of peppermint essence, mix together for 30 seconds and pour out onto a sheet of greaseproof paper. Using your pallet knife spread the mixture to a thing layer. Leave to partially set and then cut into squares. You have now made yourself mint crisps!!!! Check out this brilliant video by Gerry Wilton, international master chocolatier and MD of Chocolate Delight. 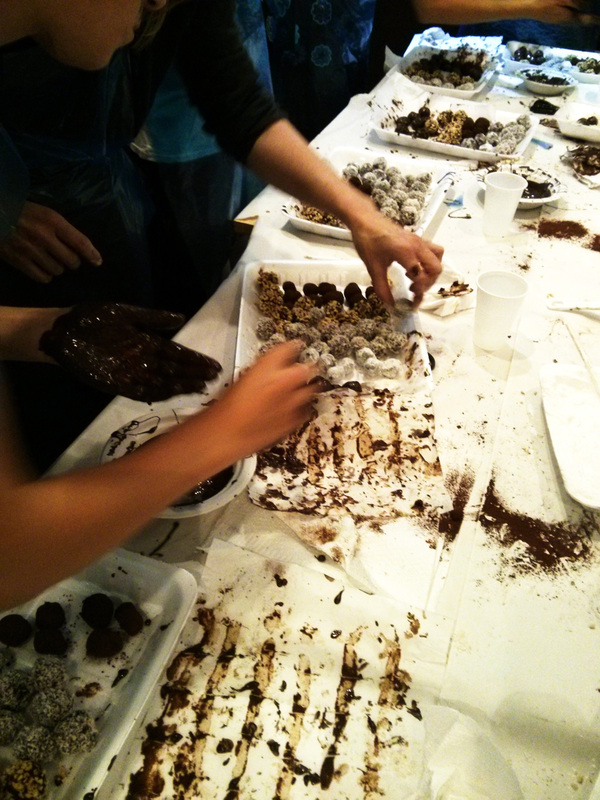 He has released a 3 minute condensed version of their truffle making course!